Tilghman Island Marina hosts a number of Charter Fishing Boats and we are quite knowledgeable of most others in the area. If you are interested in taking a Charter Fishing trip, call 410-886-2500 during normal business hours and we'll happily provide you with the contact information for Charter Boats that fit your needs. Charter Fishing Boats in this area are typically in the 30' to 60' range. Most charge between $500 to $1,200 for a full day of fishing with the majority being captained by the owner. For the most part, the main difference between Charter Boats is the condition of the boat, the boat's electronics, the fishing equipment and most importantly the skill of the Captain and his mate (when used). 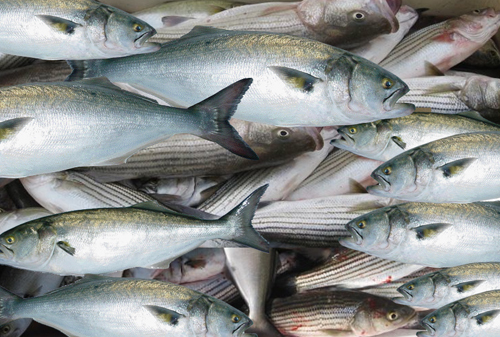 The top Captains are capable of getting you the most and biggest fish throughout the entire fishing season. The mate's job is to assist the Captain and customers in any way possible. This includes setting up fishing poles, baiting lines, getting fish into the boat, cleaning fish and assisting the Captain with boat docking. It's common for Charter Boats in this area to fish without a mate so the Captain also performs those duties. Charter Boats typically require advance reservations for either half or full day trips. All fishing gear, bait, tackle, ice, fish cleaning and packaging for your ride home are generally included in the price of your trip. Most boats accommodate up to 6 people however there are some that can take much larger groups, even as many as 20 or more. Harrison House Charter Fishing is one of your best options in this area for accommodating large groups; they can be reached at 410-886-2121. Single individuals that wish to fish aboard a Charter Boat are somewhat limited. One option would be to pay the entire cost of the Charter Boat yourself but that may be cost prohibitive. Another possibility is to try locating a boat captain that is willing to add you to a fishing party which means that you'll end up meeting some new fishing buddies. FYI - Regarding the boat's mate: Most are not paid wages; they rely heavily on tips which can range from $100-$250 for a full day of hard fishing. When there is no mate, it is customary to tip the Captain for performing mate duties. Also located at Tilghman Island Marina are a fleet of recreational rental boats, some specifically configured for fishing. For those with minimal boating experience, do not be intimidated. Over our many years of operation we've had plenty of customers that have successfully enjoyed their time on the water after receiving our free "Rental Boat Orientation". Not only will you learn the basic boating skills necessary to safely boat but you will also learn how to read charts. Additionally it helps to know that our entry level boats are easy to operate and boating traffic in this area is minimal with lots of wide open spaces making it a perfect environment for beginners. with Fishing Gear and catch your own. Captain Ron will chart you a few local Hot Spots. 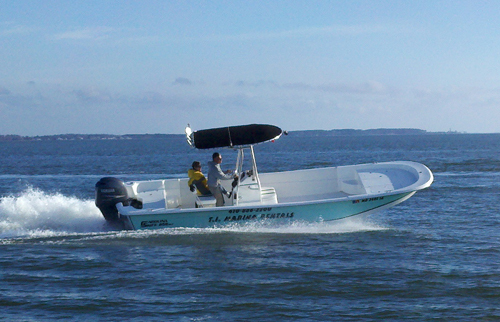 Our fishing Rental Boats range in sizes from 19' to 25'. In addition to the normal safety gear that comes with each boat, they are also equipped with a fish finder, fishing rod holders and a Chesapeake Bay Fishing/Crabbing Boat License which covers everyone onboard. 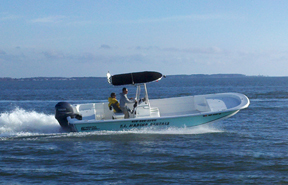 Though somewhat smaller than the average Charter Boat, they are perfect for fishing Bay tributaries. Using one to fish big waters where Charter Boats fish is also possible but only on calm sea days. For the most part, even if you can safely operate in the area where Charter Boats are fishing, most individuals do not have the expertise or equipment to fish in that environment. As such the majority of our Rental Boats spend their fishing time in the more sheltered waters of our local tributaries. Though fish are somewhat smaller there, catch numbers are usually greater. If you do find yourself fishing near Charter Boats, be mindful of getting in their way, do not cross their paths as they may have lines in the water and do not expect them to be conversational as they are trying to focus on their job of getting fish for their customers. The bottom line is, stay as far away from all Charter Boats as possible. FYI - We are authorized by the state of Maryland to issue anyone born after July 1, 1972 a temporary Maryland Boating Safety Certificate. There is no charge for this service.